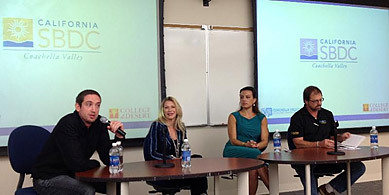 On Thursday the Coachella Valley Small Business Development Center (CVSBDC) kicked off its Business Success Program with a morning Fireside Chat featuring local business owners and valley leaders. The workshop was a complete success for CVSBDC’s kickoff event giving local businesses a networking opportunity to share ideas and talk through problems they may be facing. Business Success Program Workshops will be held on a monthly or more frequent basis, check back here for workshop details.